Shine While You Dine helps you master the seemingly complicated nuances of dining etiquette to ensure that “you shine through”. 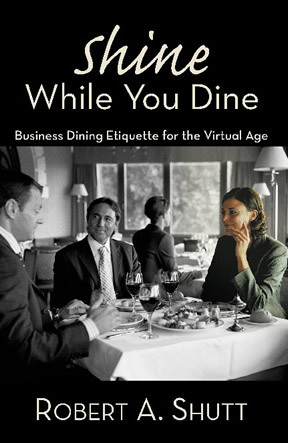 In this book, you will discover the genuine value dining etiquette adds to your professional persona. (Hint: It is not so you can show off your dexterity with the butter spreader.) You will come to understand how this skill—universal to all professions—is an integral part of our culture: past, present, and future. Finally, and most importantly, you will learn three foundations, two guiding principles, and one single objective that make it easy to follow the numerous rules, guidelines, and behaviors outlined in this book. This approach makes etiquette mastery as easy as one-two-three. Stay focused on your one single objective, use the two guiding principles to determine what behavior would be most suitable at any time and in any situation, and you will naturally adhere to the three foundations of all appropriate behavior. This approach also helps you negotiate any cultural, geographic, or formality nuances you might encounter. Shine While You Dine is an extraordinary etiquette elixir! Contact Robert to order a signed copy of Shine While You Dine. Click here to order through Barnes & Noble.